Stephanie Leitch's installation art in Interstices explores the space between things. It came like a bolt out of the blue: a contemporary artistic pioneer finding inspiration from a historical one. The germ of the idea—to project video onto rows of string suspended from a ceiling—had been at the back of Stephanie Leitch's mind for quite a while before she was invited to exhibit at the Granary Art Center in Ephraim this year. But the project she envisioned took more shape as she considered the specific space in which she would present the work—an A-frame building designed for grain storage in 1876 by pioneer artist C.C.A. Christensen. Leitch, one of the foremost installation artists of the Mountain West, has often used local culture as a focal point of her work. Her Untitled Congregation at Nox Contemporary in spring 2013 suspended rows of string dripping water into LDS sacrament cups, and Untitled Apogee at the Utah Museum of Contemporary Art at the end of 2013 used fabric, string and video projections to create an inverted topographical map of all the Mormon churches in the Salt Lake Valley. Her Untitled Edifice at the same space in Ephraim in 2012—when it was home to the Central Utah Art Center—projected inverted images of the tabernacle onto the wall. 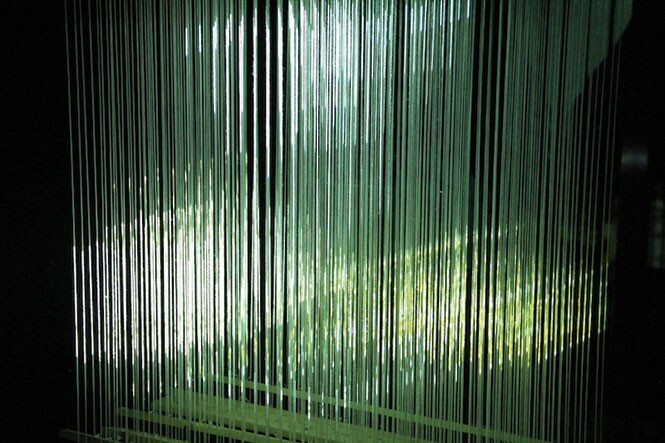 Her more recent work, however, has played more with spaces in between objects, or negative space, like The Mote and the Beam at the City Library in 2014, which connected the walls of the exhibition space with string. For Interstices, her latest installation at the Granary Art Center, she is projecting video onto string, and it adds a whole new dimension, a sculptural element. The 34-year old graduate of the University of Utah says, "I liked the idea of abstracting specific imagery by projecting onto a discontinuous surface, and seeing the layers being distorted and expanded 3-dimensionally into the field as the distance increases from the projector." Interstices found inspiration from Christensen in a second way: from his own artwork. One of the paintings from his Mormon Panorama series depicts a moment right after the assassination of Joseph Smith outside the Carthage Jail, in which the mob witnesses a man pulling back from wielding a knife at the fallen prophet, astonished as beams of light fall down from heaven. According to legend, an angel appeared and intervened, preventing Smith from further disfigurement. "The well-articulated lines in the painting hearken to the 3-dimensionally drawn lines of my work," Leitch says, "as well as the way the projection path falls upon the form. I like the idea of taking that fleeting moment of light, when the heavens seem to be physically connected to the earth." The video images used in the installation are found footage, but she has manipulated and animated them as sculptural objects. They change not only in time, like any video, but spatially, as you walk around and view them from different angles. The structure of this work suggests contemplation; the spaces beckon one to fill in conceptual blanks. It evokes a number of intellectual postulates about the relationship of the way we view the world to the nature of reality itself—from Gestalt psychology to quantum physics to media theory. The string is arranged in a matrix, or grid pattern, and instead of video creating the illusion of three dimensions on a 2-dimensional screen, Leitch adds a level of physicality, but also distance by the creation of what she calls its "field form." The work isn't complete without the viewer there, at a distance, adding another layer of depth by contributing her experience of the space, or particular moment. It's similar to the feeling evoked by Christensen's painting, when a space opens up—between heaven and Earth, between the artist and the viewer, between the idea and its realization. That gap is, perhaps, always there, but what was hidden is made manifest, fusing a connection between the two polarities. To Leitch, it's all about heightening the viewer's awareness; "I like to play with the desired but physically impenetrable field." It's not just about bringing into sharper relief what some consider "sacred space," but about a reverence for all space. In college, she studied edifices like the pyramidal structures of Borobudur in Indonesia, with walkways that circumambulate the perimeter until they ultimately reach the apex, revealing a secret which turns out to be somewhat anticlimactic. "You can't just shoot straight to the top; you've got to gain understanding of the thing as you gradually work your way around it," she says. "I liked the way this lengthens the tension between the viewer and the elements. So I make things that people want to be inside of, but are physically forced to skirt the perimeter."